On Sunday evening, Arizona Glass Alliance will very happily host a presentation by the noted sculptor and educator, Jennifer Halvorson. Jennifer brings an impressive background to her work, having been educated at three highly regarded glass programs, here in the U. S. at the University of Illinois and Rochester Institute of Technology, and the Australian National University in Canberra. In addition, Jennifer was a Fulbright Fellow in Denmark as well as a Wheaton Fellow, and her work has received recognition both in the U. S. and abroad, including the Stanislav Libensky Award Exhibition in 2010, and inclusion in both the 32nd and 35th editions of “New Glass Review”, which is published by Corning. 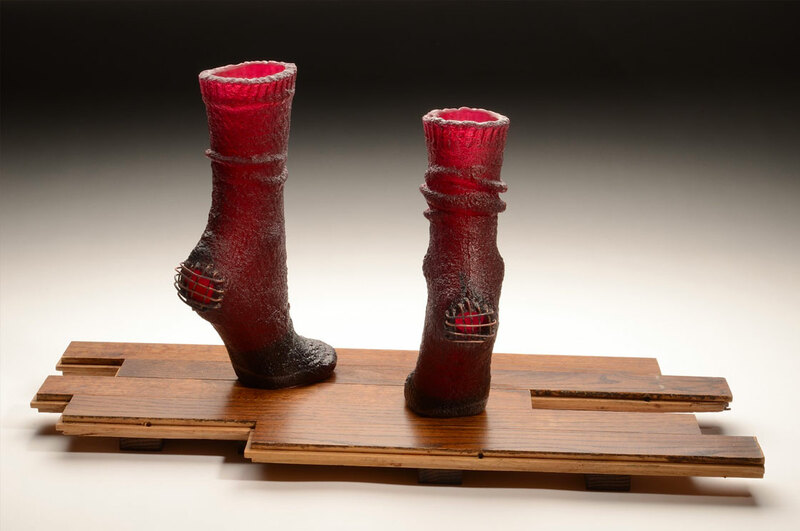 This education was not wasted, as Jennifer’s highly original and creative sculptures combine a variety of found materials together with glass, resulting in very interesting and thought provoking pieces of art. An image of one of Jennifer’s pieces is below, but she creates a very wide variety of work, and to see more of it stop by her website, www.jenniferhalvorson.com. Jennifer’s work is shown by a number of galleries and was on display at SOFA this past fall. In addition to her work as an independent artist Jennifer also serves as an Asst. Professor of Art at Ball State University in Muncie, Indiana.